When it comes to gambling, everyone knows the casino always comes out on top - right? But in the 1990s a group of students proved the punter didn't have to be the loser. This is the story of the MIT Blackjack Team. Bill Kaplan laughs, remembering his mother's reaction when he told her he was postponing his entrance to Harvard to make his fortune at gambling. "Oh my God, this is ridiculous! What am I going to tell my friends?" she said. Kaplan had read a book about card counting and believed he could use a mathematical model to make good money from blackjack. It was certainly not his mother's dream for her straight-A student son. But Kaplan's stepfather was more open to the idea and threw down a challenge. "Play me every night and prove you can win," he said. "I crushed him for 2 weeks straight," recalls Kaplan. "He told my mother 'I can't believe this but he can really win at this game - just let him go.' So my mother wasn't wild about it but I went to Vegas and I spent a year there." That was in 1977 - Kaplan took $1,000 (£600) and within nine months had turned it into about $35,000 (£20,000). He went on to graduate from Harvard and over the years kept playing blackjack around the world. Friends and partners who had previously seen 100% returns on smaller investments, stumped up a startling $1 million to fund a new company, Strategic Investments, which would train bright students to card count and gamble - and then unleash them on the unsuspecting casinos. "An executive casino host came over right away and greeted me and took me up to a penthouse suite. It had a jacuzzi, pool table - it was amazing. I was in awe of the room but I didn't enjoy it as much as I would normally have, because I was still upset about losing all that money." It was a lesson in just how volatile blackjack could be - even with a scientifically proven system. But he continued to rely on the team's method that weekend and was, in the end, able to return to college with a net profit of about $25,000 (£15,000). Casino hosts look after high rollers - clients who gamble big money - and reward them with perks of free food, drinks, tickets and rooms, whether or not they win. So the students, who spent the week going to class, eating in canteens and sharing dorm rooms, soon got used to being treated like VIPs. But they also had to look the part - something that wasn't easy for many. For Aponte, it was like going undercover. "You just have to pass that initial test where they size you up and think, 'OK, is this someone we're going to make a lot of money from?'" He says that while skill at maths wasn't a problem for anyone at MIT "what was important was being comfortable, being able to deal with the attention, because money just attracts attention." As an Asian, Aponte says he had a big advantage. "We really played off that stereotype that Asians are big crazy gamblers. So my standard story was that I came from a rich family and I was the spoiled son." At 06:00 the next morning Kaplan received a phone call. "You won't believe what I've done!" the student said. "You know I came back from Vegas and I had $125,000 (£74,000) in a paper bag? Well I left in the classroom. I totally forgot about it. I ran back and it's not there." Many worried about being caught, even though Aponte says it was usually quite painless. "You'd get a tap on the back and the security man would say, 'Mike, casino management has decided you're welcome to play any game except blackjack.'" He remembers the experience of one new team member who had just passed the tests to act as a big player. "Looking back it was a mistake as he didn't have a good look for a big player. He wore glasses, he had a very meek personality, and he just looked really smart. He was really smart - he was a PHD student." 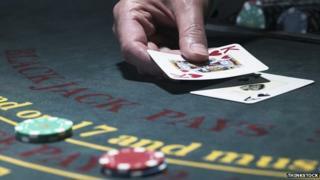 "He was up about $20,000 or $30,000 (£12,000 or £18,000) and the casino figured out he was card counting and they brought the police in. "They threw them in jail and confiscated not only all the money they'd won but the team money they'd brought with them. That player and his wife - they never played for the team again." In blackjack, or 21, high cards favour the gambler, low cards the casino. So a card counter keeps a running tally in their head, adding 1 for low cards and subtracting 1 for high cards. When their tally increases (meaning more high cards than low ones are left in the deck) they know it's time to start placing higher bets. Card counters won't win every time - they often lose a lot of money - but statistically, and over time, the odds are in their favour. It has to be done secretly because although it's not illegal, casinos don't like it and have the right to refuse to let someone play. Kaplan remembers how one 21-year-old managed to keep playing as a spotter - someone who counts cards and then signals to their partner who places the big bets when the cards were favourable. "He shaved his head, put on a wig, dressed like a woman and then he played for the longest time. He was a very good looking guy!" In the end, the increasing pressure meant Strategic Investments was dissolved in December 1993 marking the end of Kaplan's blackjack career. "As a player it's an amazing experience, but as a manager we might have 10, 20, 30 people playing in five different casino locales, some in Las Vegas, some in New Orleans, some in Canada, and we're keeping track of their play, we're trying to make sure no-one's stealing money." The venture had had mixed success and the money earned wasn't as much as many had hoped, especially as it had to be split between so many players and investors. His wife was relieved people weren't calling at two in the morning saying "I just got kicked out of Caesars what do I do?" "I was just running a business and it just seemed like so much of the business was more headaches than fun," he says. "We pulled off something that very few people have. Everyone knows the golden rule that you can't beat the house over the long run but that's exactly what we were able to pull off." Bill Kaplan and Mike Aponte spoke to Witness - which airs weekdays on BBC World Service radio.